I recently overheard a radio news presenter refer to “less people” at a particular event. The issue of whether to use less or fewer in a sentence is one that catches many people out. Another way to remember the difference is that less means ‘a smaller amount of; not as much’, while fewer means ‘a smaller number of; not as many’. Some people would argue that money can be counted. But it’s the coins, notes (and gold bars if you’re super rich!) that we physically count – not money itself, which is a mass noun and therefore uncountable..
What about numbers, time and distance? English being English, there are some exceptions to the above. Less is used idiomatically with than + plural nouns in certain circumstances where there’s a notion of quantity. This is because we’re referring to total amounts (e.g. a single period of time or the overall distance) rather than individual units. 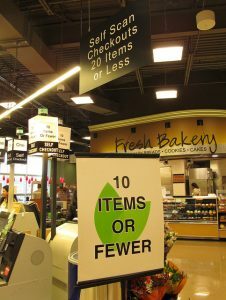 A classic error (often cited on social media) is found in the express checkout lane in supermarkets, where the signs in most stores say “10 items or less” instead of “10 items or fewer”. Some, like Tesco, even changed their signs to read “Up to 10 items” to appease the pedants and the language watchdog The Plain English Campaign. So it looks like there’s no consensus on that one. I must admit that these signs have always irked me, as I assumed they were incorrect. Now I’m not so sure! People rarely use fewer when they should be using less. 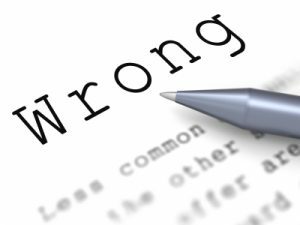 By far the most common mistake is the other way around – as in the title* (which should, of course, be fewer mistakes because mistakes are plural and countable). If you can count it, use fewer. If you can’t count it, use less. For more top tips and handy hints, do check out some of my other grammar posts. Or let me know in the comments if there are any troublesome topics you’d like me to cover.